Nothing is chicer than a short manicure in a rich fall shade, particularly steel gray, bottle green or oxblood this season. These hues are in our closets, so why shouldn’t they be on our nails as well? Steel gray is a softer alternative to black, but still edgy. An appropriate shade for the office, too! Try Estee Lauder’s Chaos to get the look. Bottle green is a bit more unexpected, but with the right undertones it can look really sleek, like Essie’s Stylenomics. Oxblood is a fan favorite, but I urge you to try a deeper shade with dark undertones like Essie’s Poor Lil Rich Girl– very cool. Love all of the greens, hoping I’ll get a green polish in my Birchbox this month – fingers crossed! Yes yes yes! I could not agree with you more! Obsessed with all three of these shades, and I’m excited to check out some of the ones you showcased here! I love this post! 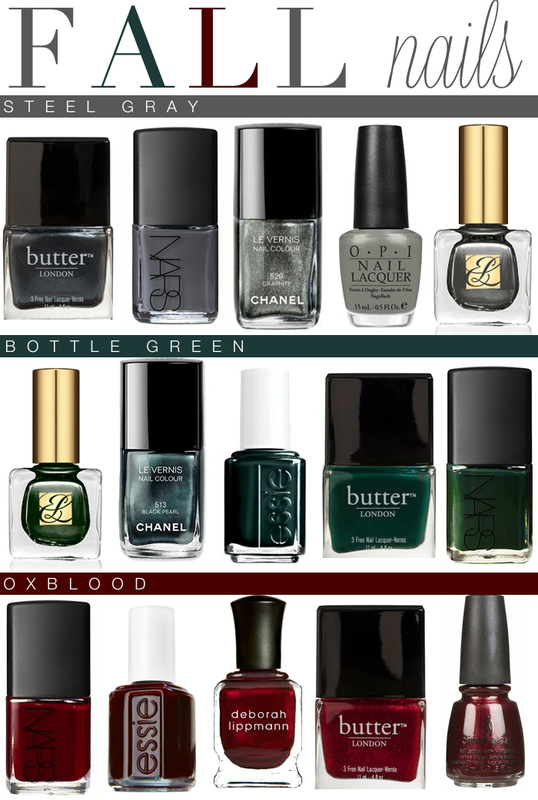 The bottle green has to be my top 5 favorite trends for fall!